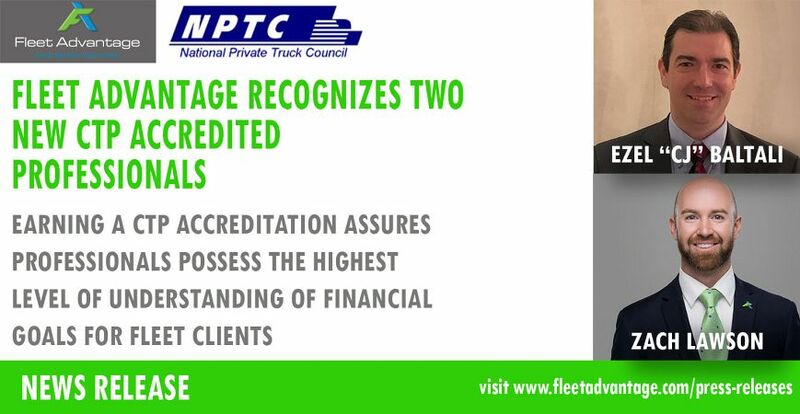 CINCINNATI, OH (April 15, 2019) – Fleet Advantage, a leading innovator in truck fleet business analytics, equipment financing, and lifecycle cost management announced today that Zachary Lawson, Vice President of Strategic Fleet Solutions, and Ezel “CJ” Baltali, Purchasing Manager, achieved their 2019 NPTC Certified Transportation Professional (CTP) recognition. Lawson has over fourteen years of experience in customer-facing roles, with the last six years in business development and management of national accounts for private fleets. His expertise in structuring complex finance and service offerings in the transportation marketplace has allowed him to provide the best solutions for lifecycle asset management and financing at Fleet Advantage. Lawson works with each client to lower their overall costs based on data and insight provided by Fleet Advantage’s innovative analytics platform, ATLAAS (Advanced Truck Lifecycle Administrative Analytics Software) and asset management services. Baltali is a seasoned professional in supplier relations and purchasing, managing purchase orders equating to over $1 billion throughout his career. He has worked in the fleet-specific industry for over fifteen years, helping customers to lower costs associated with leasing vehicles. In his position at Fleet Advantage, Baltali is responsible for day-to-day operations, price negotiations and proposals, supplier finance performance initiatives and account management. National Private Truck Council, CTP-accredited professionals excel at establishing and managing financial goals, capital investment programs, budgets, and operating plans for transportation companies. Administered for 23 years, CTP accreditation also equips professionals with the highest level of industry understanding of critical areas of private fleet management functions, such as utility cycle truck specification, operations, maintenance, safety and human resources.